There are two arguments which encourage you to wear bike glasses. The glasses are not just a stylish accessory, but they also provide perfect protection for your eyes during your sportive activities. And that again in two respects: Glasses for cycling on the one hand will keep the air stream away from your eyes, will protect you against dirt, mud and insects, and on the other hand, as a matter of course, they will provide you with the perfect UVA/UVB protection! UV rays cannot be perceived by human eyes. The more important it is to sufficienctly protect yourself against them. Since the light radiation can harm our eye, it can result in eye inflammation or even in corneal clouding. Apart from the UV protection for the eyes, the glare protection seems to be the real task on which the biker places the emphasis in his cycling sport glasses. The darker the glasses are tinted, the less light they will let pass through. Expensive bike glasses are even photochromic, thus you will save the equipment with several models and their different tinting values. If you step into the light of the sun, the glasses will automatically darken, if the vicinity becomes shady, the glasses will become lighter again. 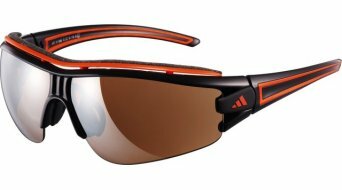 The technical term for this is "photochrome lenses", and the technology that lies behind it does not make the photochromic glasses exactly favourable in price. Whoever wants to forego the above mentioned feature of the automatic darkening / lightening, will certainly find a good alternative in glasses with exchangeable lenses. A frame which is to your liking and which suits you thus provides you with differently tinted glasses. They can be exchanged fast and easily (in most of the times with just a few clicks). In most cases, such exchangeable systems provide glasses without tinting, yellow glasses and dark glasses for an exchange. Good glasses score with fog free coatings or aeration. Nothing is more annoying than a constantly fogging up pair of bike glasses. It should also offer scratch- and breakage resistant glasses. An additional feature could also come in form of a polarization filter Such a filter absorbs reflections and light reflexes, which increases the contrast and the sharpness. In summary, some top models are full of technical highlights. That means that your expectations and requirements in regard to your new glasses will influence how cost-intensive such a purchase will be. For more heavy-duty applications, the bike goggles are more suitable. Such downhill glasses (or motocross glasses) offer more protection for downhill-oriented MTB' riders and MX pilots. Comprehensive protection for the eye area and features, such as tearoffs make sense for heavy-duty applications, such as e.g. in the downhill racing area. These glasses are strongly reminiscent of the goggles that can be seen on ski slopes. Goggles from 100%, Oakley and Fox are high up on the popularity scale. By the way, we also provide you with all accessories for glasses and spare parts, from replacement glasses up to nasal cushions. Have fun shopping - online in our bike glasses shop.